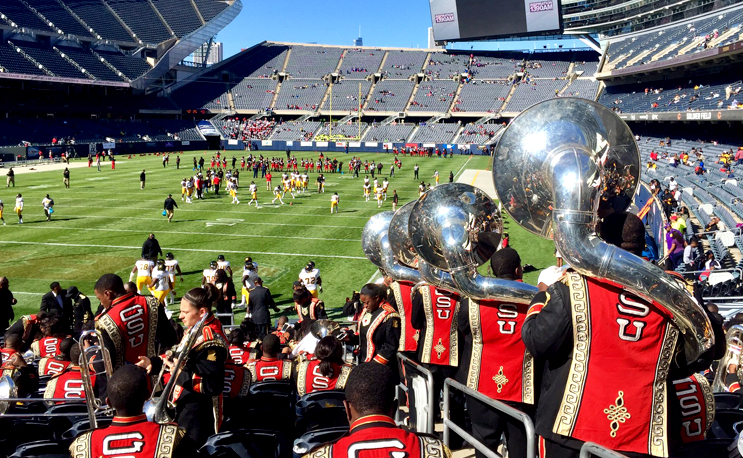 CHICAGO, Ill. | Devante Kincade came off the bench to provide an offensive spark as the Grambling State University football team started slowly in defeating Clark Atlanta, 31-20, on Saturday afternoon during the 20th Anniversary of the Chicago Football Classic at Soldier Field. Kincade, who replaced Tigers starter Geremy Hickbottom after an injury in the first quarter, tossed three touchdown passes and threw for 230 yards on 19-of-31 passing. Clark Atlanta (3-2) struck first with a 13-play, 88-yard drive, capped by a Carlos Saldana 29-yard field goal to give the Panthers an early 3-0 lead. After the two teams traded possessions, Grambling State (3-2) responded with a six-play drive. Kincade tossed a 23-yard touchdown pass to the back corner of the end zone to Darrell Clark with 3:20 remaining in the opening quarter and gave Grambling State a 7-3 lead. The Tigers forced a turnover on the Panthers’ next offensive possession and Grambling State took advantage. Kincade connected with Jordan Jones, who sprinted 59 yards to paydirt, to give the Tigers a 14-3 advantage with 1:10 remaining in the first quarter. After the two teams traded punts, Grambling State got an interception by Chris Grant, to set up shop at the Panther 35-yard line. The Tigers got a 26-yard field goal by Marc Orozco to push the advantage to 17-3 with 12:17 left in the first half. Clark Atlanta responded with an eight-play, 82-yard drive and used 3:26 off the clock as Deandre Jackson caught a six-yard touchdown pass from Johnathon McCrary to cut the Grambling State lead to 17-10 with 8:45 remaining in the second quarter. The Panthers continued to trim the margin as Saldana kicked a 42-yard field goal with 1:19 left in the first half as Clark Atlanta closed the gap to 17-13. Grambling State got the ball to begin the second half and the Tigers marched 45 yards in just three plays to extend the lead to 24-13. Kincade, with his third touchdown pass of the day, found a wide-open Jones down the left sideline for the 36-yard score with 13:55 remaining in the third quarter. The Tigers started to pull away late in the third as Grambling State used a 65-yard drive and took 2:15 off the clock as Lyndemian Brooks scored on a two-yard run, with 2:43 left, to push the advantage to 31-13. Clark Atlanta closed the margin to 31-20 with 3:53 remaining as McCrary connected with Jackson for a 25-yard touchdown, but that would be as close as the Panthers would get. Grambling State started out of the gate slowly but found its rhythm late in the opening quarter. With starting quarterback sidelined with an injury, Devante Kincade came off the bench to provide the spark. The senior from Dallas, Texas connected with Darrell Clark for the first touchdown pass, a 23-yarder, and hit Jordan Jones for a 59-yard strike to give the Tigers a 14-3 lead with a little over a minute left in the first quarter. Despite a sluggish second quarter, Kincade continued his big day and found a wide-open Jones down the left sideline for the 36-yard score. Devante Kincade threw three touchdowns and was 19-of-31 passing for 230 yards. Grambling State amassed 313 total yards of offense, including 239 yards in the air. Clark Atlanta finished with 428 total yards, including 371 through the air. Grambling State registered 10 first-half penalties for 104 yards and finished with 17 for 181 yards. Darrell Clark caught four passes for 48 yards and one score. De’Arius Christmas recorded 13 tackles, including six solo stops and one quarterback hurry. Ja’Terrious Pouncy added five tackles, three solo, and one interception. Johnathon McCrary threw for 371 yards on 23-of-55 passing and had four interceptions. Deandre Jackson finished with eight catches for 129 yards and a pair of scores. J. Victrum finished with 14 tackles, including 11 solo and one sack. Grambling State went 1-for-1 in fourth-down conversions.